EISS puts a great deal of focus on excellent kids programs and facilities. Creating progressive kids programs backed by an international team of professional instructors is paramount in any international resort these days. The Yeti is our friendly hero. 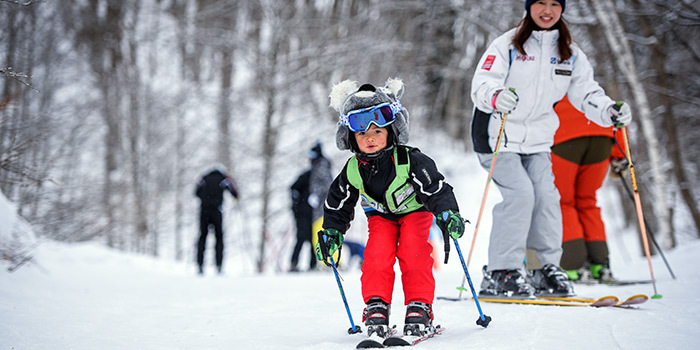 Come and learn all of the tricks of the trade with him at our friendly Hakuba Ski School. 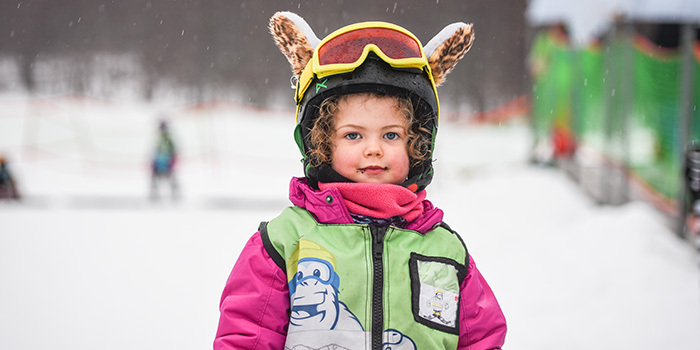 Yeti Club is all about getting kids into skiing while having a ton of fun – whether it’s their first time or they can already ski. The children will be thrilled with their very own Kids Centre (for the 3-6 year olds), their very own sheltered learning environment (now both indoor and out) and also a “magic carpet” area. All programs have lunch inclusive. Your child will be taught under the safety of qualified EISS staff members who ensure they receive the best care possible. Children should arrive for sign in wearing ski gear ie. Boots, outerwear, helmet, gloves and goggles. Parents must collect a lesson ticket and complete the emergency contact form and bring to sign in counter on the day of lesson. It is not required for children to bring any additional equipment or clothes or food. Please do not pack individual meals or snacks unless you wish to cater for a special dietary requirements and please inform staff at sign in if you choose to do so. Skis should be brought into the centre on the first day of sign in to ensure they’re clearly labelled (skis may be left in the centre over night for multi day skiers – only for 3-6 year olds). 3-6 year olds will not require poles unless they’re a “red belt” ie. Level 5. Please do not bring poles to the centre for beginner/intermediate skiers. Children who unwell, cold or tired may spend time with our friendly indoor staff at the discretion of the instructor. Flexi-Week provides the flexibility to take part in full-day programs for up to 7 consecutive days for a similar price to that of 5 days. 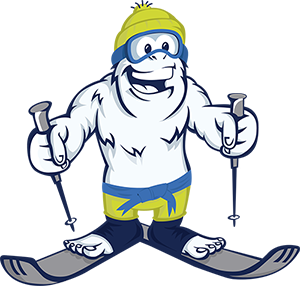 That’s 2 free days up your sleeve to have a rest day, go on a monkey tour – or for you to use in ski school! Evergreen International Ski School sign in desk. Pick up from the same place at 13:30 for morning half-day lessons and 15:30 for full-day lessons. Certainly. 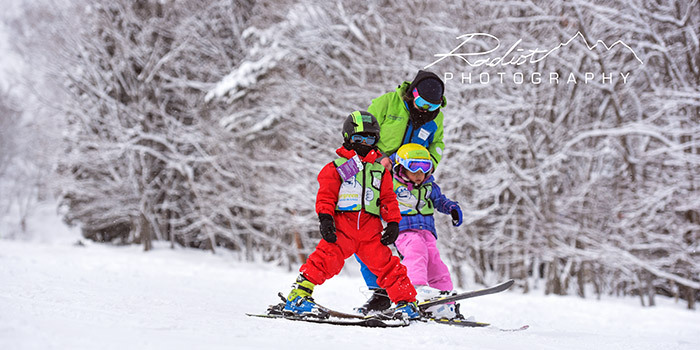 Our programs are designed to accommodate all skier abilities. 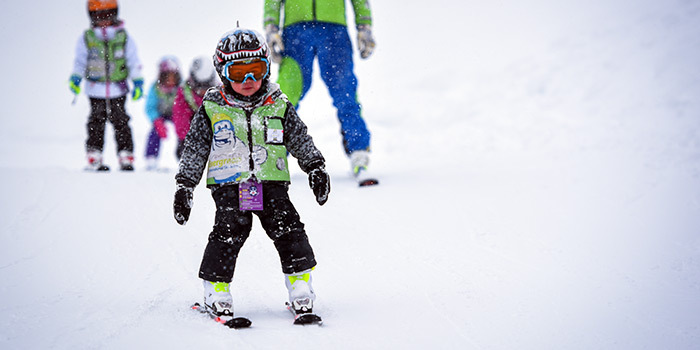 All guests are encouraged to discuss their own or their children’s skiing ability with our staff upon their arrival. Groups are transient and are often re shuffled on an as needs basis to ensure they are working cohesively. Instructors monitor students’ progress daily, using specially designed report cards which are attached to the child’s snow wear. My child is young and needs assistance getting dressed, eating and toileting. Can I stay with them? We would prefer that you did not. Our centre is equipped to deal with the needs of young children and our experienced staff have knowledge of their developmental needs. We have specially designed toilets for 3-6yr old children, and lunch time is completely supervised. Naturally we will assist them in getting dressed and undressed when required. All children must be toilet trained, however we have spare clothes in the event of an accident. Pull up nappies/diapers are welcome to be worn as we understand that even the best toilet trained 3yr olds sometimes get caught by surprise. We take allergies and medical issues very seriously at EISS. It is imperative that any child diagnosed with asthma or anaphylaxis have their doctor-signed action plan with them, in addition to their medication. For 3-6yr olds, this is signed in on arrival. A child without an action plan or medication may be refused entry to the centre. Medication such as Ventolin or EpiPen must be carried on the child at all times and the child will be identified and ‘labelled’ at sign in (3-6yr olds). For older children, parents are encouraged to discuss these conditions with their instructor when dropping off their child. We ask that you be very specific at sign in or drop off regarding exactly what dietary requirements or medication needs your child has. Our kitchen caters to most common dietary requirements, however you are welcome to discuss any unusual requests prior to your arrival via email or phone. Whilst our chefs are trained in how to prepare allergy-friendly food, and take every precaution to minimise cross contamination, we understand that some parents would prefer their child eat their own pre-prepared food. Children with diagnosed allergies are welcome to bring a packed snack and lunch, or can be picked up for lunch if you would prefer to supervise them yourself. I'm nervous about leaving my child in case they don't enjoy it. Can I stay and watch? In short….yes…you can. BUT ….we really encourage you to do so at a distance or even better …out of sight. The reason being, typically children settle into the routine and happily follow along with their peers as soon as the parent is gone. Tears, whilst these can be heart-wrenching, are not uncommon on the first day. There are many reasons children get upset, but most commonly the overwhelming nature of a busy and new environment, coupled with the initial separation can be enough to set them off. Often on subsequent days it becomes much easier….so don’t give up! Ensure they are dressed in warm and waterproof clothing with a well-fitting pair of goggles. Keeping them comfortable but not to the point of overheating. 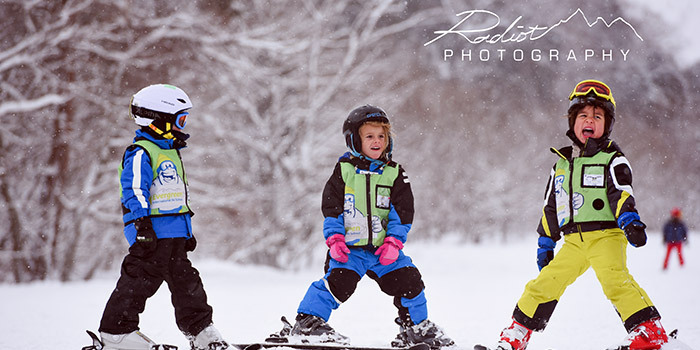 Let them practice walking in their skis and boots before arriving at ski school. Familiarity with their equipment is very beneficial. Arrive early and have paperwork pre-filled to reduce time standing around. Allow time to say goodbye and keep handover short and sweet. Ensure they are wearing their boots so you are not having to change them when they may be distressed. Naturally if any child appears distressed or unwell, we will attempt to notify parents immediately. Sometimes they may spend a little extra time indoors until they settle down. If your child is 3-6 yrs old, then it is unlikely they will require poles. Your instructor will advise you if and when any Yeti Club participant needs poles. If they are in the most advanced Yeti ability level, you can bring them in and they may be used at the instructors’ discretion. Poles left in storage at the centre are stored at your own risk. It is preferred that they be left at your accommodation unless requested. Children will all learn at different rates, and typically the younger the child is the longer it takes to master a skill. One must also factor in snow condition, weather condition, physical and mental fatigue and group dynamics. 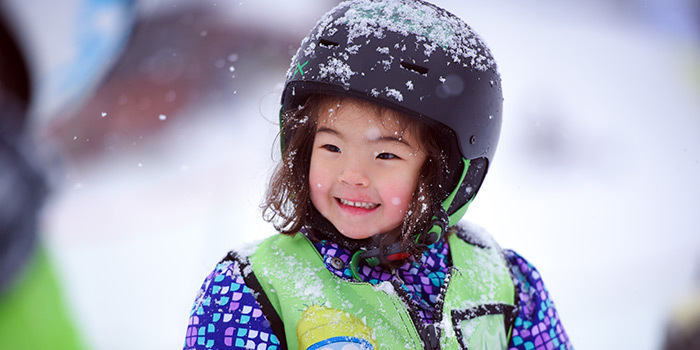 A 5 or 6 year old may be skiing independently after 2-3 days, whereas it might take closer to 4-6 days for a 3yr old. There are no hard and fast rules to the rate at which children progress. However, it is important that they are enjoying themselves. And remember, even if they do not graduate from the magic carpet, these little people will have learned many other invaluable skills such as identifying and safely using equipment, remaining within a boundary, listening to and following instructions, and partaking in group discussions and games. My child is 6 and a very good skier. Can I put them in Hakuba Heroes instead of Yeti Club? Ensuring your 5 and 6 year olds stay in the yeti club gives us a better chance of consistent grouping of skill and developmental needs. On some occasions, we may blend our stronger Yeti’s with an appropriate Hero group on snow. But this is something that we would organise internally.